Three businesses were damaged in a fire on Friday night in Oceanport. One firefighter was injured. Justine Talarico stood across the street from her burned business of 41 years, Just Hair and Nails. She looked past policemen and firefighters as they extinguished the last of a three-alarm blaze Friday night. She said after Superstorm Sandy left her salon under two feet of water, she was up and running within a week. She said she’d quickly rebuild after this fire. She got close enough to her shop to peek through the entrance. Hair products were still neatly lined up in front of the mirrors along one wall, the floor was soaked and dirty, the front window was grimy from smoke, firefighters blasted ceiling tiles with a hose. Talarico gasped. This damage was worse than the storm. Talarico’s business was one of three in the building damaged in the fire, which began at about 9 p.m., according to Oceanport Police Lt. Michael Kelly. Talarico’s salon and adjoining Enzo’s Deli and Pizza suffered “significant” damage, Kelly said. An adjacent post office endured lighter smoke and water damage. One firefighter was taken to a hospital to be examined after suffering from heat exhaustion, according to Kelly. Nobody else was injured. Authorities believe the fire started near the back of the businesses. They’re investigating the cause, but have no reason to believe it is suspicious. Authorities had the fire under control in about 15 minutes, Kelly said. They spent another hour and half extinguishing hot spots and examining the building. Talarico, now 65, started attending a beauty course at night when she was in high school. At 18, she graduated and started working. At 24, her parents spotted a vacant shop and helped her start her business. She payed them back and stayed in the same shop ever since.Talarico and her employees cleared their appointments for the weekend, expecting crowds and traffic for Sunday’s William Hill Haskell Invitational horse race, which will take place just a few blocks away. But she has to work quickly to find a way to serve customers and keep her business. 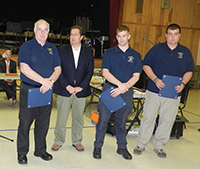 Councilman Joseph Irace (second from left) thanks Oceanport First Aid Squad Capt. John Connor, 2nd Lt. Ryan Kondracki and 1st Lt. Jeremy Dalton for their lifesaving efforts. Three members of the Oceanport First Aid Squad were honored recently for rescuing a person on the railroad tracks as a train was approaching. Councilman Joseph Irace (second from left) thanks Oceanport First Aid Squad Capt. John Connor, 2nd Lt. Ryan Kondracki and 1st Lt. Jeremy Dalton for their lifesaving efforts. At the May 21 Borough Council meeting, Councilman Joseph Irace, Chairman of the Public Safety Committee, presented certificates of recognition to Capt. John Connor, 1st Lt. Jeremy Dalton and 2nd Lt. Ryan Kondracki of the First Aid Squad for a rescue which took place on Mother’s Day. The three were returning from a shared service call in Little Silver when they noticed someone on the tracks, unconscious. “They rescued the person and transported him to the hospital, thereby probably saving somebody’s life,” Irace said. Connor said that it was an intense situation. Dalton thought he saw someone on the tracks, and they got out to investigate. “The train was coming,” he said. “They were blowing the whistle. That’s 20 seconds to get to the train station.” “If we were 30 seconds later…” Connor said. He said that Dalton’s sharp eye was the reason that the man was okay today. In related news, during the same meeting Mayor Michael Mahon issued a proclamation recognizing May 17-23 as Emergency Medical Service Week in the borough. On May 21st, three of our members were recognized at the Oceanport Boro meeting for their actions that resulted in saving a person from being hit by a train on the evening of May 9th, 2015. Captain John Connor, 1st Lieutenant Jeremy Dalton, and 2nd Lieutenant Ryan Kondracki were returning from Riverview Medical Center in Red Bank from a first aid call in town. While driving past the Little Silver Train Station, Jeremy observed a victim lying on the train tracks while a train was approaching the station. The crew quickly pulled over and ran to pull the victim off the track with mere seconds to spare before the train arrived at the station. The crew then transported the victim to the hospital for treatment. As spring approaches we continue to work to improve not only our service to the community, but our organization as well. We have successfully become a certified training center with the Emergency Care and Safety Institute (ECSI) and will offer CPR. First Aid, and other related courses on an at least monthly basis to anyone who is interested. See our CPR Training page for more information. In addition, we recently took a look at our out of date Bylaws and Constitution and make an overall reformat and restructure so that new members can better understand the rules and regulations of our organization. As we head into May we want to remind everyone to wear sunscreen if you plan on going out. We often don't realize that the sun can still cause sunburn in the springtime. Help us to spring into safety this year. With February designated as American Heart Month, numerous events are planned that will offer everything from blood-pressure screenings to tips on how to maintain a healthy heart. The idioms are endless: Home is where the heart is. Bless your heart. Be young at heart. Absence makes the heart grow fonder. Well, now is the perfect time for a heartto heart conversation. According to the Centers for Disease Control and Prevention, heart disease is the leading cause of death for both men and women. In recognition, February has been designated as American Heart Month. Several area health care chains are advancing the use of technology to lessen the time it takes for a patient to be seen by a cardiac team and to ease the procedures if an emergency does exist. RBMC’s Code Heart initiative reduces door-to-balloon (D2B) time — the crucial period between a heart attack patient’s arrival at a hospital and the time he or she receives lifesaving coronary intervention. Paramedics are now transmitting realtime electrocardiograms (EKGs) that record and transmit the heart’s electrical activity from out-of-hospital locations to the hospital. Cardiac interventionists at the hospital review the same EKGs that the paramedic sees. Once the diagnosis is made that the patient has experienced a heart attack, a Code Heart is activated and RBMC’s cardiac catheterization lab team — led by the cardiac interventionist on call — prepares to go to work, even before the patient arrives at the emergency room. “At our medical center, we believe in providing the latest in emergent and elective cardiology treatment for the community,” said Dr. Puneet Sahgal, a board-certified interventional cardiologist and medical director of the cardiac catheterization lab at RBMC. By following Code Heart protocols, RBMC’s D2B median time improved from 78 minutes to 64 minutes between January and June 2014. The national benchmark is 90 minutes. Also helping to reduce treatment time is the implementation of a new cardiology physician practice, Garden State Heart Care. With three qualified cardiologists, the practice will open this month in the new Medical Arts Building at the hospital’s campus on Route 18. The new building includes comprehensive outpatient and surgical services. In the same vein, Bayshore Community Hospital in Holmdel recently unveiled its new Multi- Specialty Interventional Suite, outfitted with advanced technology capable of performing complex minimally invasive cardiovascular, endovascular and interventional radiology procedures. According to Dr. Shaddy Younan, medical director of the cardiac catheterization laboratory at Bayshore, the D2B has been reduced to 45 minutes at the hospital. Younan said he believes the statistics will improve further, considering that the interventional suite has only been operating for a matter of weeks. Younan said there are close to 1 million catheterizations and angioplasties done each year in the United States. Bayshore receives around 60 heart attack patients annually who require an emergency procedure once admitted. The new suite at Bayshore allows professionals from various departments —surgeons, radiologists and cardiologists — to work together in one technologically advanced space to make the procedure less invasive for the patient. “If a surgeon starts a procedure and realizes he needs to switch procedures, he has the capability to do so in the new room,” Younan said. This is especially critical for anesthesiologists, who previously had to move their equipment to different rooms, he said. In addition, Younan said the new suite uses advanced equipment, such as an intravascular ultrasound to see blockages better; optical coherence tomography, which is similar to infrared technology used to see 3-D images inside the artery at a high level of detail; a new type of angiography that replicates all angles of the heart using one injection of a small amount of dye, instead of the former way of separate dye injections to achieve separate angles; and better software that reconstructs 3- D images to fix aneurysms in a shorter amount of time and makes biopsy imaging easier for radiologists. “From my perspective, obviously no one wants to come in for a procedure. But you want it to be as positive an experience as you can,” Younan said. OCEANPORT: Decked out in uniform dress, the borough's emergency responders took their oaths as leaders of the Oceanport fire houses and EMS squads. Raising their right hands, the first responders were sworn in to their annual terms, as were many others -- it's part of the annual task of the borough's reorganization each January. The first meeting of the year is held to appoint volunteers, name professional contracts and honor outgoing officials, plus swear in elected council members to start their terms. Sworn in to another term on the borough council were Richard Gallo and Ellynn Kahle, elected to three-year terms. Christopher Paglia was sworn in to an unexpired term on the council. Among the professional appointments was Assessor John E. Butow, Borough Clerk Jeanne Smith, Chief Financial Officer Gregory Mayers, Tax Collector Peggy Warren, and Municipal Court Judge Richard Thompson. John Connor was elected as the First Aid Squad Captain to serve for the year. Jeremy Dalton was elected as the First Aid Squad 1st Lieutenant and Ryan Kondracki was elected as the First Aid Squad 2nd Lieutenant. Margaret Lippolis was elected as the First Aid Squad Sergeant to serve for the year. The fire officials were also sworn in: Wes Sherman was elected as the Fire Department Chief; Mike Patterson is Fire Department 1st Assistant Chief; and Tom Gallo is the Fire Department 2nd Assistant Chief to serve for the year. Fire Department Outgoing Chief Wolf was presented the Ex-Chiefs Badge, and a special plaque and jacket honoring him for his service. Gregory Widmaier, and Robert Howie were sworn in as Fire Police Members for the Oceanport Hook & Ladder Fire Company. Dale Burd, Bill McNish, Bob D'Agostino, Paul Hannisch, Alfred DeSantis, Clarence Brocklebank, Frank Lippolis, and Joseph Sherman were sworn in as Fire Police Members for the Port Au Peck Chemical Hose Company.